Here's a previous post about how an author can lay the groundwork for a series whether he wants to or not. Once you've read McKinty's Sean Duffy books, why not try his other work? My favorite from a strong field there is probably Dead I Well May Be. Adrian McKinty has expressed skepticism of series fiction, but he does a fine job writing it. 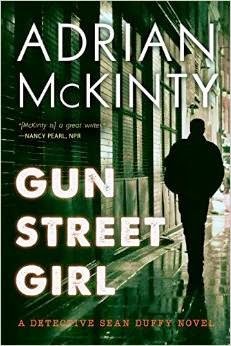 Gun Street Girl, fourth in his Troubles no-longer-a-Trilogy (following The Cold Cold Ground, I Hear the Sirens in the Street, and In the Morning I'll Be Gone), shows McKinty laying the groundwork for further books, whether consciously or not. The novel lays down plots and subplots ripe for development in future books, and it continues at least one subplot (or is it a leitmotif?) from the previous novels. (This book is set against the background of the 1985 Anglo-Irish Agreement, and includes thinly disguised versions of other historical events of the time, including one that will be of especial interest to Americans.) Moreover, it proposes a vision of Northern Ireland's post-Troubles history as a long-range game, so a long-range series could well carry Detective Inspector Sean Duffy along with that history, reacting to it and commenting, sometimes acerbically, on his place in it. In Gun Street Girl, that commentary includes McKinty's customary good jokes and one of the funniest Beatles references you'll read anywhere. Most important, perhaps, for its long term-prospects, the trilogy series has, in Duffy, an engaging protagonist/narrator with personal and professional triumphs and defeats that never, however, get in the way of the story. So sorry. Adrian. You may be in this for the long haul. I am skeptical whether series characters can work over a long haul. Occasionally they do work and the characters lives and interests develop in profound ways: I always cite the Patrick O'Brian series where books 9 - 18 were the highpoint of the fleuve taking the characters to new geographical and psychological locales. In other series it hasn't worked so well. I'm not going to mention any names here but we all recognise books where the author is spiritually, emotionally and physically exhausted and is only going through the motions. Monty Python once brought out an album called "The Contractual Obligation Album" and I've felt that a few series titles I've read recently shld have been called that too. Not to mention the occasional indulgence in drugs and alcohol. But I'm sure you can understand why I made the post I did. Duffy gets a new young assistant with whom he is impressed, for example. There's subplot for future books. He admires the kid now, but that kid could wind up at a higher rank in a future book, in a position to cause Duffy angst. So Duffy has narrative and historical reason to go on, should you come up with a convincing way to keep soul and body together. Er, to keep Duffy's body and soul together, that is. I'm sure you can do a good job with your own. ---- me, and I read that, too. You could always claim that novel was a dream, though. Look, you decide you want to make Lawson a sub-plot in Back in the Crowd, After You Die, or Yesterday's Here, you'll figure out a way to do it. The concerns about Duffy's personal well-being are well taken. What I think will sustain the series is how important Irish history is, and that new ground for Duffy can be found as events unfold. Dana, that's what I was thinking. But his professional life is in constant flux, and that can go on only so long. So there's plenty of history he can be part of if he can stay in one place for a while. I don't know to what extent the RUC was integrated administratively with other UK police forces, but at least in England there would be the possibility of moving -- or threatening to move -- our man to another force for a while. I'm not sure whether what would have been feasible or realistic in Northern Ireland in the 1980s, though. Thanks for the repost. I wd have commented earlier but I've been in Germany. Yep, I read you were heading to Germany. I moderated a Bouchercon panel one year with two Danish writers, two Swedes, and an Italian. Several of the authors remarked at the difference between European events and American ones. In Europe, they said, sessions will generally last longer, with more time for authors to discuss their topics at greater length. There's something to be said for that, and the result was amusing. One of the Swedish writers would start working himself up to informative, detailed answers, then cut himself short and apologize. I was browsing crime festivals for possible attendance later this year, and I saw you listed, complete with picture and biography in Spanish (which I could read and understand!) for the Semana Negra in Gijon. Are you going to that, too? I was there last year, dont know if I'll be back this year. I'll be at Crimefest in Bristol in May. Stu and Steve will be there. Anthony Quinn and Ruth Dudley Edwards, too, plus the usual gang of Scandinavians, including one very special one: Maj Sjöwall. I've just finished McKinty's trilogy so now I'll have to check out the fourth book. You're right on the money, his novels put you right in the middle of the 'Troubles' through the eyes of a cop in the middle. I like your concept of history-based novels. It's a shame no one has done so well for the 1960s in America. James Ellroy does a nice job of creating a plausible yet non-stereotypical version of the 1960s in America, I think, though his characters are hardly ordinary people, in the manner of Sean Duffy. It's hard to imagine an American counterpart as a plausible character rather than an emblem or a symbol or some crap like that. Sorry to be a pest, but while you're on an Irish kick and talking about history-based novels, take a look at "Lies of Silence" by Brian Moore and "The Wild Colonial Boy" by James Hynes. Moore writes about an ambitious hotel keeper trying to stay neutral while Ian Paisley is going to speak at his hotel. Hynes tells the tale of an American college student whose grandfather gives him some money for the IRA. You can guess what happens. Brian Moore has been on my radar for a while. I've been on an Ireland (especially Northern Ireland) kick for some time. My current reading is Voices From the Grave, Ed Moloney's book about Brendan Hughes and David Ervine, based on the Boston College archive of interviews, so the kicK continues. I had not heard of Hynes, though. Thanks. I like your blog! If you are interested in more reviews of books in the genre Scandinavian Crime please visit my blog: www.svenskabestsellers.com. I have added your blog to my blogroll, please feel free to add mine to the bloggroll on your site. Charles G. Booth: What do you know about him?